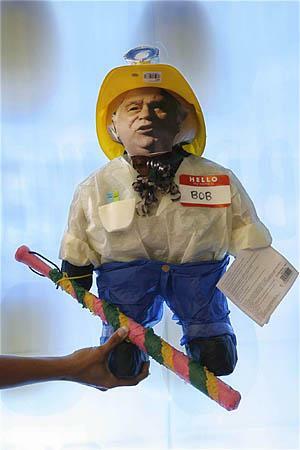 A papier-m�ch� "Little Bob" pi�ata, depicting Crandall Canyon coal mine co-owner Robert Murray, is part of a public-relations battle accompanying the tragic events at the mine. PRICE - Gov. Jon Huntsman Jr. and Crandall Canyon mine co-owner Robert Murray are each catching their share of heat - and praise - in the wake of their high-profile public relations battle. The volleys have included calls for safety investigations, threats of layoffs, hero celebrations and, sometimes, flat-out name calling - including a papier-m�ché ''Little Bob'' piñata. Sunday, Murray's Utah- American Energy faxed a statement "to calm the outrage" that the company claims has flared against the governor after Huntsman called for inspections of Murray's West Ridge and Tower mines. The Salt Lake Tribune, which has reported extensively on the safety issues in Murray's mines, is also a target of the communities' outrage, the statement said. Huntsman's spokeswoman Lisa Roskelly, says the governor has received about 200 messages from constituents, evenly split between criticism and praise for his actions. Sen. Mike Dmitrich, D-Price, who represents Emery and Carbon counties and has been appointed to Huntsman's safety commission, said he hasn't gotten any formal complaints about the governor or Murray from his constituents, but from his conversations with people. "They more than likely are supporting the governor," he said. Danny Erickson worked at Murray Energy's West Ridge mine before being laid off. Erickson, a father of five, says his enjoyment of mining is gone since the tunnel collapse at the Crandall Canyon trapped his cousin Don Erickson. "I commend [Huntsman] for making sure it's safe," he said. Fred Roberts started work at the Crandall Canyon mine on Aug. 6, the day of the collapse. Instead of mining, he found himself on the top of the mountain helping to set up a rig to bore holes in the rescue effort. Roberts blames Huntsman for the Tower mine's layoffs, saying the governor has taken safety concerns too far. "Every mine's different," Roberts said. "That doesn't mean all the other mines are bad." Others say Murray's true motivation in laying off the miners was not safety, but to turn the community against Huntsman. "It's not the governor that's laying them off. It's Mr. Murray," said Anita Brady, whose husband works at the nearby Deer Creek Mine, not owned by Murray Energy. The statement defended Murray from some family members' complaints that he shouted them down when they questioned his decisions. The statement went on to enumerate Murray's efforts, including directing more than "34 pieces of massive mining equipment" and 134 rescue miners, drilling six nearly 2,000-foot boreholes and spending tens of millions of dollars, "which no one in our Companies has ever mentioned, as finding the trapped miners has been our only focus." But that depiction of the mine owner is in stark contrast with the memories of many in the community. Just days before Christmas last year, Murray laid off more than 100 workers, a time many say will be remembered as "Murray's Christmas." "When he first bought the mines, he didn't even try to get the community behind him," said Jay Peak of Carbonville. "He came in and said, 'This is how it's going to be.' He disregarded all the people who were there." Mike Dalpiaz, vice president of the United Mine Workers and mayor of Helper, said Huntsman has given a voice to the miners who couldn't speak out for fear of losing their jobs. "The workers need help," Dalpiaz said. "By God, it's about time somebody is helping them." Finally, some have accused Murray of orchestrating a show for the news media to divert sympathy to himself. "He's just putting on a front," said Brandon Erickson, the son of Don Erickson. "He doesn't give a s--t."
That anger resulted in Price resident Kris Daugherty and friends making a piñata of Murray that they call "Little Bob." Requests for more Murray piñatas are coming in from all over town, she says, and even from Mexico, the homeland of two of the trapped miners, Juan Carlos Payan and Luis Hernandez. On Monday, Huntsman called for a "Celebration of Heroes" in Huntington on Sept. 15, that will feature former Utah Jazz basketball great Karl Malone. Roskelley said the event is to allow the community to "appreciate all the heroes who have been involved in this. Just to celebrate the mining communities. These are great people. Truly the salt of the earth." But many are weary of Murray and Huntsman's exchanges. Rep. Kay McIff, who represents Emery County and also is a Mine Safety Commission member, said he has seen no outrage against the governor. "Most people's focus has been on moving beyond the verbal exchanges and trying to find solutions and making sure our mines are safe," McIff said. Price resident Ron Jewkes said he's disgusted. "Murray and the governor should have both backed off," Jewkes said. "Common sense. There's not a lot of it being demonstrated right now." * NATE CARLISLE contributed to this story.